Betta fish are beautiful, graceful pets. They are also known as Siamese Fighting Fish because a male betta will fight another male betta to death. For this reason, you must keep only one betta in a tank. A male betta is so entertaining, you will find you won't even need other fish anyway. So, You'd Like a New Pet? A Betta is a Great Choice! Betta fish are wonderful pets! If you've ever been in a pet store and you've seen beautiful fish swimming peacefully in small bowls on shelves, you've seen betta fish. Betta fish are actually quite aggressive fish when faced with other male bettas. This is why you always see them kept in separate small bowls. If kept by himself, a betta is a really great pet. A male betta has long flowing fins and a long tail. Bettas love to swim slowly around their surroundings. If provoked, a betta will flare his fins, which can be really entertaining. However, I would not recommend annoying your betta so he constantly flares. It is actually believed to be a little stressful for your new fish buddy. If you decide you would like to buy a betta, make sure to pick one that looks healthy. Don't choose a fish that has spots on his body. This is an obvious sign of illness. Also, it is always a good idea to observe the bettas in their bowls at the pet store. Make sure to pick a fish that is active. You might think choosing a peaceful fish is best, but you really want one with a lot of energy. This suggests he is less likely to have health issues. You also want to look closely at his fins and tail. If the edges look too jagged, it may mean he is ill. Fish can sometimes suffer from fin rot and you do not want to deal with that if at all possible. Don't just assume the sales person at the pet store will sell you a healthy fish. In many cases, the sales associates at pet stores receive very little training regarding fish health. Basically, they want to make a sale, so just be careful to view your fish for a while before making a decision. Once you've picked a betta fish, you are going to want to pick a nice home for him. Some people will tell you bettas can live in an incredibly small space because of the tiny bowls pet stores keep them in. This is simply not true. Bettas actually need some space to swim and it is cruel to keep a betta in a bowl or aquarium smaller than 1 gallon. Also, please do not buy a "betta vase" for your new pet. This was quite trendy for a while. The betta vase advertised that you could buy a betta, put him in a vase full of water, and put a plant on top. Bettas did not live long in this situation because the vase was too small, they needed actual food instead of plant roots to eat, and the water needed more oxygen. Please don't make that mistake. Now that you know what not to do for your betta, let's discuss the right type of home. I personally believe a small aquarium is the ideal place for a betta to live. 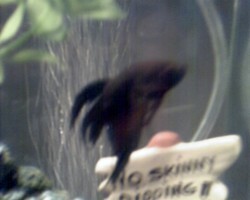 A nice 2 - 3 gallon tank is a good size for a male betta to live happily on his own. With that size aquarium, it usually comes with a nice filtration system. Trust me, it is so much easier having a filter for your betta because this means you don't have to clean the tank often. Sometimes you can get by cleaning it just once a month with a good filter. If you do not have a filter, I would recommend cleaning it every two days. That is a big difference in cleaning schedules, isn't it? If you insist on a bowl, a bowl that is at least 1 gallon is the best size for your betta. You will want him to be able to get exercise. Remember, an active betta is a happy betta! Part of the fun of having a betta fish is decorating his fish tank. Your betta fish will enjoy having some items to hide behind. At the pet store, you will find many accessories your betta will enjoy, such as fake plants, caves, treasure chests, and rocks. Please don't learn this the hard way - don't bother buying your betta a fake fish decoration to put in the tank. He will believe it is another male betta and attempt to attack the fake fish. The same goes for any other decoration that looks too much like another fish. This list includes sharks, clams with faces, an octopus, starfish, and any other cute fish-like decorations. After buying the tank, the filter, and decorations, don't forget other important items like fish food. Most pet stores sell food that is specifically made for bettas. Aside from that, some stores also sell freeze dried worms that betta fish will enjoy eating. You also must get a water conditioner for your fish tank. This will help remove any harmful chemicals and chlorine from the water. 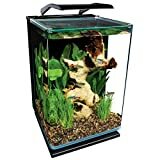 Your betta fish must not have water with chlorine in it, so don't forget this item. Last, you should get a bag of gravel that has been created for aquariums. This will be good to add as a layer at the bottom of the tank. You will need this for certain filtration systems and to place the plants in the tank. Once you have all the items listed above and you have a betta fish, you are ready to begin your life as a fish owner. Make sure to put the aquarium in a spot that doesn't get too much sunlight (because of algae) and your fish tank is all set. Congratulations! It is rewarding being a pet owner. A betta fish is an excellent pet for small spaces. If you need a pet for your apartment, a betta is an excellent choice! Wow, that takes a lot of nerve to own piranha. I would never feel comfortable cleaning the tank. Salt water fish are so beautiful! They are just more of a challenge to care for, so I stick with freshwater fish. Thanks for reading my article and thanks for the comment, QuantumLouie! You are right. I don't have a tank right now, but I miss it. I am thinking about getting a new one in the very near future. Thanks for visiting my article and for the comment. Fish are great pets! I had a tank with few fish. I used to spend whole evening watching at them. Does Your Goldfish Swim Upside Down? Do you know the cure? For some people, pest snails are one of the most frustrating fish problems. Pest snails multiply quickly, which can make it hard to see your fish through the glass.